This commentary by Fr. Justin Mathews, RS Executive Director, originally appeared in The Kansas City Star on January 21, 2019. From a Birmingham jail in 1963, Dr. Martin Luther King Jr. wrote a letter on scraps of newsprint to so-called “moderate” white clergy. While Dr. King languished in a jail cell for his convictions these clergy published an article in which they agreed with the cause of civil rights and economic inclusion for African Americans but were hostile to Dr. King’s timing and tactics. Dr. King responded saying, “I am sure that each of you would want to go beyond the superficial social analyst who looks merely at effects and does not grapple with underlying causes.” The key difference between the solution of these men and Dr. King’s was their different understanding of the roots of the problem. Dr. King’s insight is worth meditating on as our city is still talking of solutions to domestic poverty, racism, housing affordability, etc. It’s challenging to move beyond superficial analysis as Dr. King urges us to do. This is especially the case with problems as complex as domestic poverty. After many years of discussing this with others in my role as a nonprofit leader and priest I can say with confidence that most people assume that poverty is ultimately rooted in a lack of material things and laziness. Therefore, if we can give the poor more of the things they need and combat laziness we can solve poverty, right? I believe these are symptoms of poverty, not its underlying causes. Acts of compassion and charity help the poor to survive today with more dignity and are certainly necessary, however, they never seem to make a big enough dent, move the needle, or offer lasting change. They address symptoms but not the root cause. As we invest to fix the effects of poverty in one area we disinvest in another and the cycle starts again across town. We never seem to route the roots of poverty as we intend. What Dr. King knew from lived experience of segregation and what I believe having listened to the family stories of hundreds of our neighbors in need is this: domestic poverty has largely grown from the tangled roots of racial discrimination and the scarred soil of economic disinvestment. These are the forces that created the conditions for multigenerational poverty and trauma that we now see in neighborhoods struggling to survive and succeed. There have been enough editorials in the newspapers about the history of streets like Troost Avenue in Kansas City, redlining, and segregation to support my historical analysis. Without meaningfully addressing these real historical underlying causes of poverty where they still exist, and their many lasting effects on communities, our solutions to poverty will always fall short of our best intentions. So, how do we take Dr. King’s advice and grapple with these underlying causes? First, invest significant community assets in developing new local social ventures. We must invest in emerging models that push the bounds of business returns towards social dividends and pull the nonprofit heart strings towards entrepreneurship and self-sustainability. Businesses, nonprofits, and neighborhoods should work to establish win-win hybrid solutions for our community by proliferating the number of social ventures that bring together the best of business, faith, and philanthropy to benefit all. This is urgent— especially where needed redevelopment threatens to displace or exclude the most vulnerable and longtime residents. The market is an amoral force. It takes moral men and women to bend the market to moral aims that benefit all. Second, counteract community disinvestment with many small acts of sacrificial personal investment. While we can’t always influence those who do not share our perspective on poverty we can counteract community disinvestment with our own intentionality and sacrifices. Dr. King knew that solving the underlying causes of domestic poverty would take even greater personal sacrifice from all Americans than did the fight for civil rights. This was the genesis of the “Poor People’s Campaign” set to launch but then halted by his assassination. We take up this work again and live in solidarity with the poor in our community by investing in the people in our own neighborhoods, trying to forgive and remain in relationship with a difficult neighbor, seeking to understand the family stories and perspectives of new and different neighbors, sharing generously even when our resources are scarce, and so on. Third, seek out “creative tension” that can awaken a moral conscience. We can quite easily live in neighborhoods, attend schools, walk in social circles where everyone is just like us. We are no longer segregated by law but by choice and by economics. In order to participate in real solutions that benefit the entire community, there has to be tension, honest conversation, an understanding of the right root causes of the problem of poverty. The challenges of gentrification and affordability are very present moral, political, spiritual, and economic dilemmas in our city, but they also present opportunities to get creative, take direct action, and seek new solutions that awaken our moral conscience. These conflicts are our golden opportunity to foster what Dr. King called “creative tension” that can stir us from “do-nothing-ism” and “lukewarm-ism” to reconciliation. In order to solve the problem of domestic poverty we have to rightly analyze its underlying causes so that we can support meaningful solutions. We don’t just need economic development, but do-no-harm development strategies. We don’t just need charitable work but a personal commitment to see each other charitably, as family. I believe now is the time to grapple with the real underlying issues of poverty, growing new solutions from the roots up, not the symptoms down so that all may prosper. For Angela, she has to work hard minute by minute to put life in perspective. She has come so far from her life of addiction. She remembers a time when the meth she craved seemed to be the only thing she could think about. She wrote poetry to help her work through the emotions and the struggles of that time and what it took for her to break free (see Angela’s poem below). Before the dope house, Angela and her younger brother witnessed their father getting shot and dying right in front of them. She was seven years old. “I lost everything. I lost my home. I lost my marriage. I’ve lost relationships with my family and with friends. I lost my kids for 2 and a half years,” she says. These memories and experiences keep me on track, I suspect. But I have to learn how to forgive in order to let go. With tear filled eyes I hit my knees and pray. As I negotiate once again with my foolish pride. If only I could have realized all the lives that were being impacted. I’ve also learned how to cope with triggers and temptations. All of these things have helped me in my recovery, I have found. For I have found a life I’ve always desired. A month and a half later, Angela made the decision on her own to go back to rehab and she stayed for six months. That is where her way of thinking, her choices, her way of life really was challenged and she began to see her life ahead in a more positive light. She still had 32 months of probation to serve because of the drug charge, but she was clean and on track to get her children back. One day she was sitting and talking with her probation officer about work options and he recommended she go through the Culinary Cornerstones program with NourishKC, a Reconciliation Services’ partner organization. She learned basic culinary skills, got her food handler’s certification, and began interning at Thelma’s Kitchen at Reconciliation Services. After her five week internship in Thelma’s Kitchen, she was hired on as Kitchen Assistant. “My life … I don’t consider it a sob story. I consider it more of a victory,” she said. At Reconciliation Services, we strive daily in our interactions with our neighbors, guests, clients, interns, and volunteers, to see their strength. Sometimes strength is hidden beneath years of struggle, addiction, or trauma, but we believe it is there waiting to be revealed. Everyone has a “victory” story waiting to be written! Click here for a short video about Angela! A speech delivered by Fr. Justin Mathews, RS Executive Director, at the 6th Annual Troost Jazz & Soul Experience on April 28, 2018. Welcome and thank you for being here tonight to support the work of Reconciliation Services at the 6th Annual Troost Jazz & Soul Experience! With these often quoted words of Scripture every generation is taught that we must labor to shape history because history’s shape is naturally circular. Each time we convince ourselves that through the trickle of time the shape of tomorrow will improve itself, by itself, the price we pay for repetition gets greater. If we desire the shape of our children's future to be more comley than our own past we must live and lead intentionally. So I have come here today not simply to share the inspiring outcomes of Reconciliation Services’ programs over the last year and to thank you for your generous support of this work, but to say that together, even if just on this one corner of our city, we are shaping history. We are keeping history from repeating itself on Troost, and in our country more broadly, at a time when there is a note of urgency. At RS we see day in and day out the effects that poverty, discrimination, trauma, and depression have on some of our community’s most vulnerable. That’s why we are here. We work to seek racial and economic reconciliation one heart at a time, through strengths-based Healthy Community Initiatives, Social and Mental Health Services, and Economic Community Building. Our continuum of care offers a tested template for community healing tailored to help the most difficult-to-reach in a supportive and culturally competent environment. Each moment of care, each work of mercy, each act of compassion you gave was a moment of solidarity where you stood with a neighbor in need and opened up pathways of healing that exist no other way but in this way, that we love one another. But knowing the nature of history, how can we be sure we are not repeating the mistakes that long ago cast Troost as the dividing line of our city? Knowing the nature of history, are we sure the conditions of families that have sweltered in the heat of poverty for generations are finding relief? Yesterday on Troost, 100 human beings suffered the brutal yoke of slavery on Rev. Porter’s plantation. Today, in the top 10 zip codes RS serves along Troost thousands of families are still suffering the yoke of poverty and trauma. But we imagine a Troost of tomorrow where we set the GPS of our priorities and civic policies to direct us towards love for our neighbor as our ultimate destination; a Troost where we become truly free. Yesterday, Troost was known as Millionaire’s Row, a place where only the wealthiest in Kansas City lived. Today, the largely market-driven development on Troost is pushing property values sky high again and making even student or middle income housing hard to find. But we imagine a Troost of tomorrow where all can afford a place to live. A Troost where citizens take the time to plan together and build economically and racially diverse neighborhoods as a superior growth model for the health of the whole city. Yesterday, Troost was set ablaze during the Holy Week riots of 1968 after the assassination of Dr. Martin Luther King. Today, the memory of those days and subsequent dismantling of our city’s urban core still fuels the fear that keeps us divided. But we imagine a Troost of tomorrow where we began to heal from the wounds inflicted by racism, classism and individualism; A Troost where we face our fear of each other. The reality that is unfolding before us now as the east side is redeveloped is that while economic development is underway rent is rising but wages are stagnant. A mass transfer of ownership is being transacted but the capital gains are primarily being realized by one community. The increase in the standard of living in one part of the city is resulting in a decrease of the standard of living for the poor who now are struggling to remain in their neighborhoods. Therefore, we are working to cultivate a healthy community with those who have suffered the long dying of poverty and promise of treatments that alleviate symptoms but never deliver a cure. That is because the cure is not programmatic but personal. It is not a diet from indifference but a decision we all make to live differently. Tonight I am honored to introduce you to one courageous woman, a dear friend, whose 20 year journey to discover her strength and find deep healing for her wounded heart is proof that healing is possible for all of us. Nora’s journey with RS from homeless to homeowner, from wounded heart to wounded healer, shows that when people find love and belonging at RS they magnify that that love and belonging to others. Transformation is happening one heart at a time. What we need is a healing movement in Kansas City; a movement born not from momentary religious or political zeal but from the firm conviction that each of us is called to take up a new manner of living, thinking and doing such things as are well pleasing to God and grounded in love. The devastation of trauma is the sharpening stone of poverty that cuts across race, gender, age, class and geography. So this movement must be about healing the trauma that continues to devastate poor neighborhoods in Kansas City, but it must also be about offering healing to the wealthy and those whose wounds are more easily hidden. All of us have been wounded by poverty and all of us have participated somehow in the wounding because we’ve been taught lies about poverty, race and place - some of which we are still unlearning. We must be reconciled with each other. And this requires moving now from an institutional approach where organizations take action to a personal approach where organizations set the stage for people from our divided communities to take action together. The work of RS has always centered around building relationships. It all started with food, when the primary outreach work of RS to the community 30 years ago was feeding the hungry out of a humble kitchen. That was our starting point for reconciliation -- food and community. With your support tonight Thelma’s Kitchen will build upon our mission to transform Troost from a dividing line to a gathering place revealing the strength of all. In many ways it is a symbol of how we think community development can be done together. It is our stake in the ground that says we will not be moved from this place or deterred from our mission. It is our “come as you are” sign promising welcome and refuge for all. It is our demand of those pushing progress to slow down enough to value people more than progress. It is our moral accounting that recognizes cash can’t heal the blight of the heart that makes even the rich poor, for that requires consciousness, commitment, capacity and connectedness. And most of all, it is our tribute to the life and love of Thelma who taught us radical love of God and our neighbor. **Watch an excerpt below of this speech captured via Facebook Live! When you think of someone who may need help getting their birth certificate or ID, who do you picture? Do you picture a woman who has fled domestic abuse and knows she cannot go back home because it's not safe? Do you picture a man desperate to apply for a job, but the car he has been living out of was stolen along with all of his personal papers and belongings? Do you picture a woman trying to rebuild her life after serving time in jail? Do you picture a homeless woman trying to get a copy of her birth certificate but not having an address to mail it to? Do you picture a displaced single mother needing to get her kids' birth certificates so she can enroll them in school? We have seen all of these situations at Reconciliation Services, people walking through our doors, hoping we could help them get that piece of paper or little plastic card that could set them on the path to self-sufficiency or rebuilding what they had lost. However, not everyone we serve is poor, homeless, or desperate. We have also helped people that may simply need some caring direction and information about how to access their documents. When Diane Charity first came to Reconciliation Services, she was inquiring about document needs for some students she was working with at Cristo Rey. Herself a community activist, as the president of the Manheim Neighborhood Association and chairman of the Community Advisory Board for KCPT, Diane knew that RS was an invaluable resource for the community. Diane said she decided to go ahead and request one from New York State where she was born. Diane was at a loss. She went back and forth with the office in New York and tried to figure out why they didn’t recognize her mother’s first name. She wasn’t sure what to do next. That’s when she decided to go back to the place that had been such a great resource for her when she had tried to help others, Reconciliation Services. With a little help navigating the process and patience from caring RS staff, Diane was able to get her birth certificate so she could renew her driver’s license. RS will provide nearly 1,400 IDs and birth certificates in 2017 and we have become one of the largest providers of document and ID assistance in the state of Missouri. We have seen firsthand the importance of that birth certificate and ID in order to access health care, housing, school enrollment, visiting a sick kid in the hospital, opening a bank account, voting, and so much more. Walking “with” someone in the process is what sets RS apart. We don’t just offer a voucher or payment for a document. Our caring case workers help clients navigate through paperwork, offer guidance, and often advocate for them with other agencies. Even an active and dynamic community advocate like Diane may need a little support at times. “At Reconciliation Services I felt like they really cared about me. It really renewed my faith in humanity. It is good to be reminded how valuable each person is,” she said. Thriving, vibrant community life shouldn’t just be reserved for some. When everyone, the whole community, has access to the same services, privileges and rights, we will be a healthier, more engaged city. Join us in seeing the strength of our community revealed as we strive to ensure that all its members can participate, sharing their hopes, their experiences and their lives. Learn more about the “I’D Be Campaign” and consider giving a little so that someone can get their ID today! Vibrant community cannot happen in isolation. However, for many of our senior citizens, isolation, lack of transportation, and limited social and service opportunities prevents them from participating in and contributing to community life. A recent University of California, San Francisco study showed that nearly 20 percent of senior citizens live alone and 40 percent experience persistent loneliness. Research published in Health Psychology also shows that seniors who are isolated are at higher risks for illness, cognitive decline, stroke, and obesity. It even states that loneliness is as damaging to one’s health as smoking 15 cigarettes a day. And yet, we know that our older community members have so much to offer. At Reconciliation Services we are engaging our older community members and encouraging them to draw from their many years of knowledge, skills and experience and volunteer with at risk young people in area schools, early childhood centers, Children’s Mercy Hospital, and Family Court. The RS Foster Grandparents Program of Jackson, Clay and Platte Counties provides a small pre-tax supplemental stipend, and equips them to provide support, kindness and encouragement for children with critical social, emotional and educational needs. The program is part of the larger Senior Corps initiative, which engages American adults age 55 and older in meaningful volunteer opportunities. More than 85 RS Foster Grandparents are in schools, early childhood centers, hospitals, and family court from North Kansas City to the Hickman Mills School District. They volunteer throughout Jackson, Clay and Platte Counties in over 30 locations. They live and serve in our community and they give their best to kids in our community day after day. By partnering with teachers, administrators and site supervisors, we use evidence-based programming to measure outcomes. We are looking to make a real and sustainable impact in the lives of these young people. In the early childhood centers, pre-K programs and daycare settings, Foster Grandparent volunteers focus on developing the emotional health of the children. Foster Grandparents are paired with children who need individual attention and work on school readiness, anger management, friendship and relationship skills, coping skills, and other critical developmental building blocks that are necessary for success. For Kindergartners through high schoolers, RS Foster Grandparents focus on improving educational engagement, specifically working towards more class participation, assignment completion, fewer absences, less need for discipline, and adopting an overall positive attitude towards learning. The RS Foster Grandparents volunteering at Children’s Mercy Hospital and at the Family Court offer comfort and emotional support for children in the midst of difficult circumstances. Grandma Lucille has been volunteering at the Family Court for over 20 years and at 93 years old, she still gets down on the floor to listen to and play with the kids. This important involvement in the lives of young people and the sense of purpose in the community is improving the lives of our senior volunteers. According to the Quality of Life Index measurement, more than 80 percent of Foster Grandparent volunteers reported a greater sense of well-being because of volunteering. The effect of this one-on-one care and attention also has a profound effect on our youth. A report by MENTOR: The National Mentoring Partnership showed that at-risk youth who met regularly with a mentor were 55 percent more likely to enroll in college; 78 percent more likely to volunteer their own time; 130 percent more likely to hold leadership positions; 52 percent less likely to skip school; and had fewer recurring behavior problems. Healthier and happier seniors and youth make for healthier and happier communities. Click here for more information about the requirements and benefits of the RS Foster Grandparents Program. And click on their names to hear from some of our RS Foster Grandparents: Grandpa Jerry, Grandma Juanita, and Grandma Sims. Many in our community are not only battling the after effects of trauma but they also have to push through negative stigmas of mental health problems in order to find help and healing. Nearly all Reconciliation Services (RS) clients suffer from various combinations of mental illness, lack of education, unemployment or underemployment, homelessness, and social isolation. Anonymous self-reporting by RS clients indicates that 59% witnessed violence recently; 53% are victims of violence; 36% have been convicted of a crime; 5% are currently in a gang; 69% use tobacco; 14% use illegal drugs; and 6% feel in danger at home. These very troubling assessments and the great need for effective support and therapy made it crucial for RS to launch our SnAP (Strength eNergy And Power) women’s program in 2011 as a way to help women work through the trauma and depression that many women in our community were experiencing. This one-of-a-kind program was piloted in collaboration with Jackson County Cares Mental Health Fund and is now funded by JCCMHF, the Health Care Foundation of Greater Kansas City, and Humana. It is promoted and facilitated in the context of community fellowship and encouragement through group meetings. We refer to our SnAP program as “stealth mental health” because this group setting, although run by a clinical therapist using proven evidence-based practices and clinical measures, functions as the “camouflage” to allow this therapy to fly under the radar of the deeply entrenched stigma of mental health in the African American community. We witnessed again and again the success of the individual women who graduated from the SnAP group and we were confronted with a growing awareness of the need for mental health services for men as well in the surrounding neighborhoods. 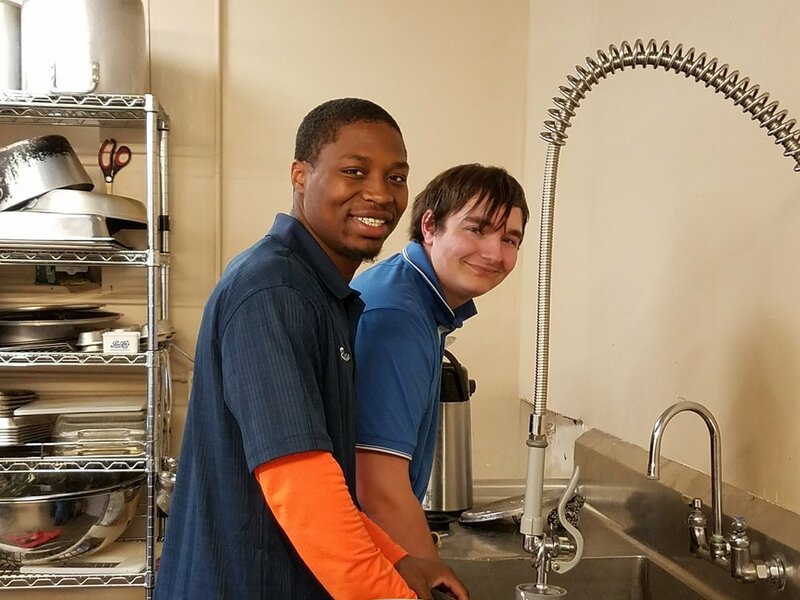 With each graduating class of the women's SnAP group, we saw the men in their lives as well as other clients and neighbors who visited in our RS Cafe ask if there was a group available for the men. These men were bearing witness to the change and success that they were seeing in the women, and naturally wanted the opportunity for themselves! It was in the context of this growing local awareness that it became increasingly obvious that there was a need for the SnAP program to expand its reach to the men in our area. In 2017, due to extended funding for the program, RS was able to expand the SnAP program to include a men’s support group. As community advocates and social workers, we were aware of several key issues that warranted the development of a men’s component of SnAP. The US Department of Health and Human Services Office of Minority Health related some staggering survey data that revealed Black men, more than White and Hispanic men, said they experienced feelings of sadness, hopelessness, worthlessness, and that they find everything requires great emotional effort. This data confirms what we at RS understand and witness daily. Moreover, we recognize that the root cause of these issues originates from profound trauma individuals face in the neighborhoods we serve. For both the men and women of our community here at 31st and Troost, the impact of trauma is deeply felt, but not obvious or easily identifiable. The reason for this is largely due to the pronounced stigma of both mental health and receiving mental health services in the African American community. This stigma is made all the worse when speaking to men. The messages that men receive from their communities, often leads them to believe that seeking help for their mental health is a sign of weakness. For many men we serve at RS, the mere thought of weakness can keep them from the life changing effects of therapy and mental health services. Now with our men’s SnAP program, the men of this community can lean on each other without shame and dig deep into the issues that haunt them, in order to reveal the their hidden strength. See stories of strength from these SnAP participants: Cassandra, Nora, and Bridgette.